In 2016 AECOM was helping the San Francisco Public Utilities Commission develop design guidelines for their South East Wastewater Treatment Plant. AECOM tasked us with developing engaging way-finding and enhancing how the plant communicates with its surroundings, with the goal of turning the plant into an approachable, proud, and educational facility. Instead of simply designing signage that explains how the facility works and where to go, we integrated the way-finding into the building infrastructure, influencing the architecture, the layout of the campus, and how the entrances are configured. Everything is designed around the user experience, not just for visitors, but also for workers. We made the pipe itself an entrance feature, improving how workers arrive at their workplace. Signage and for seating situations now use soundscapes and lighting to transmit intuitively water levels and workload. We made the defensible parameter around the campus more transparent with portholes that show live periscope images of the facilities. 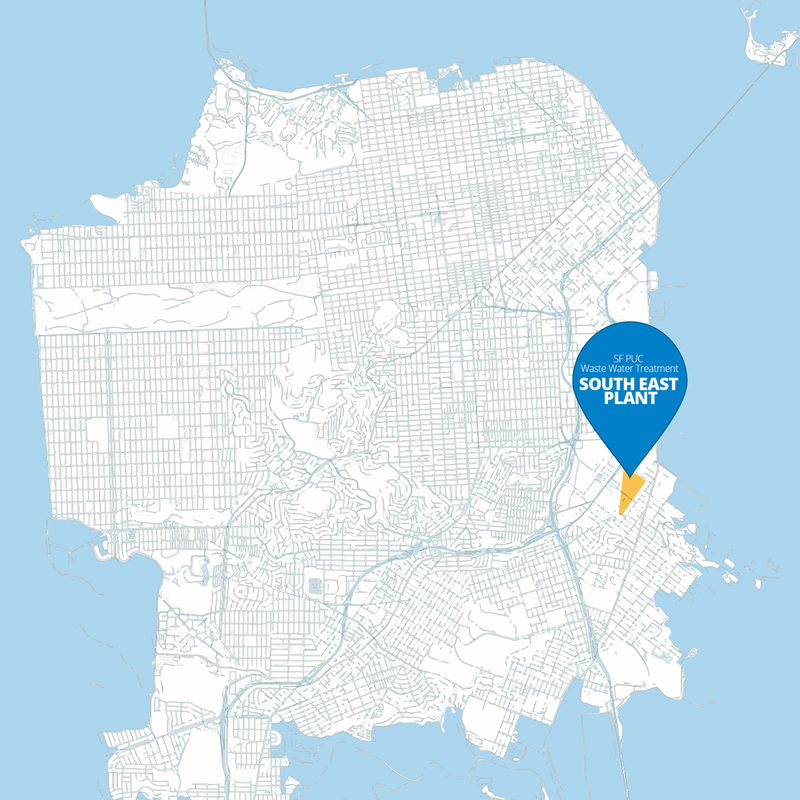 Located at the corner of Evans Ave and Phelps Street will be the visitor center / new classroom that will help bridge the gap for the community by communicating what the SFPUC is working on over a 25-year period. We applied the same principles to our design of their new Visitor Center as we did with "The Perfect Classroom." 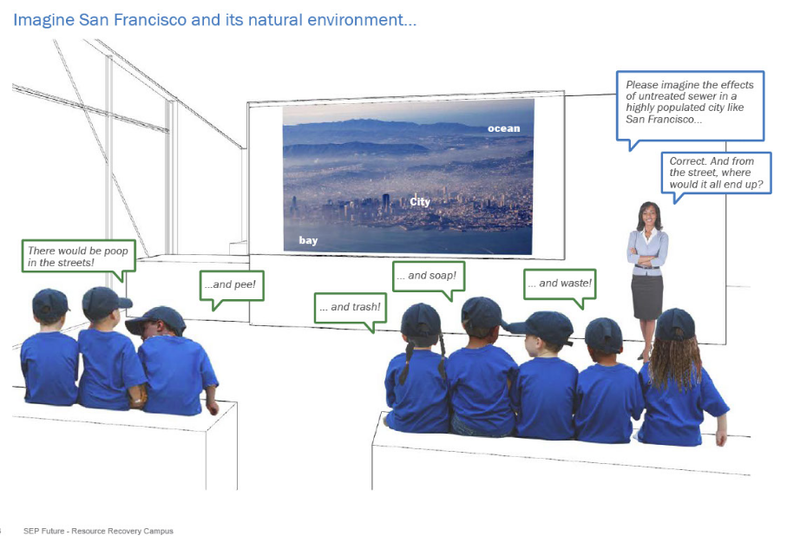 In the future the plan will be to develop and build hands-on experiments in collaboration with the Exploratorium. Concept is to have a modular interior that's easy to format for presentations, work groups or gallery style viewing. Due to Jens-Peter's extensive knowledge in education, we were able to create a lesson plan on how the water system works. After attending and observing the existing tour, we were able to develop an improved structure to the guide. We turned the lesson into a hands-on experience. Students and visitors discover through experiments how the facility works. Over the course of the lesson, we motivate the visitors to become investigators and engineers to solve problems themselves. With a simple, hands-on experience, we send people home as stewards of the environment. This diagram is used as another way-finding tool throughout the campus to show which building is responsible for which part of the process. Color, material, fabrication, location of building numbers. Easy to find and see visual markers serve as breadcrumbs that can be seen from far away. This is especially important since the distances between blocks on this street are so wide.